Now its been overdue for a nice nostalgia trip. Playing Saturn games was nice for a spell. I remember seeing the games on a shelf as a wee lad, and had no idea what the system was but thinking the big cases were the coolest thing I had ever laid eyes on. I did not know anybody with a Saturn though. 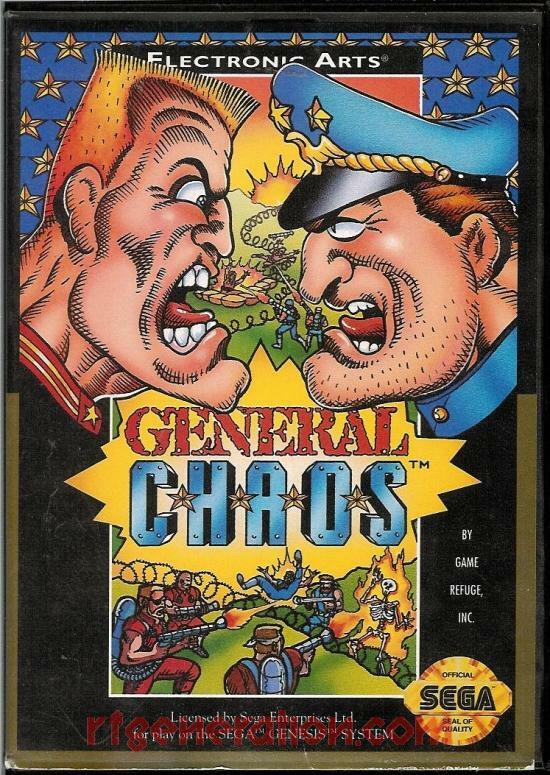 I did know multiple people with a Sega Genesis though, and one of them had our game today, General Chaos. 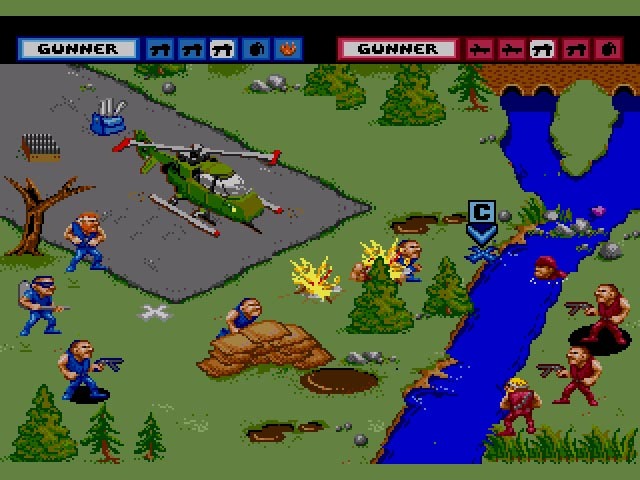 General Chaos was developed by Game Refuge Inc. and published by Electronic Arts. General Chaos is a real time action game that can also be said to be an early RTS game, without the base building aspect of the modern genre though. This game focuses on micromanaging a squad of soldiers against another squad of soldiers, its much more tactical and the real time battle system sets it aside from many turn based games of the time like X-Com and is closer to playing like Syndicate. It was developed by Game Refuge Inc. This company’s founders, Brian Colin and Jeff Nauman, were well known as arcade developers for Bally/Midway, developing classics such as Rampage and Arch Rivals, and later followups such as Rampage: World Tour. The art style is cartoony and the style is definitely going for completely whacked out and crazy. My friend did not have the box and manual for some reason though, so my recent purchase was glorified by flipping through the incredibly cheesy comic book right at the front of the manual. The graphics are quite good, and there is plenty of action on screen at any one time. There are multiple types of soldier, and each one has their own weapon, range, strengths, and weaknesses. How you move in the game and what type of squad you decide to go with can have a massive impact on your success in the field of battle! While the AI is rather stupid there is a two player option, and that’s what I remember playing the most at my friend’s house. We would blow the crap out of each other in this game and have a blast while doing it. Playing the AI is a rather interesting affair. 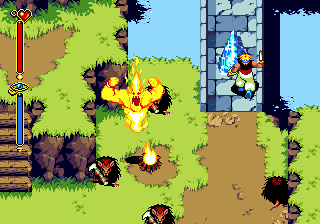 At first your opponents are quite stupid and just run into your fire, and winning Close Combat sections are quite easy. Its not too difficult to win outright and storm General Havoc’s capital city on this first round. You then have a choice to play again, and this time the AI ramps up the difficulty. It may take a few tries to best this medium difficulty. There is then a third tier of difficulty that’s even harder. This is it though. You can only play three rounds, for a nice gradient from easy, medium and hard. This game is a cult classic now, and its quite easy to see why. 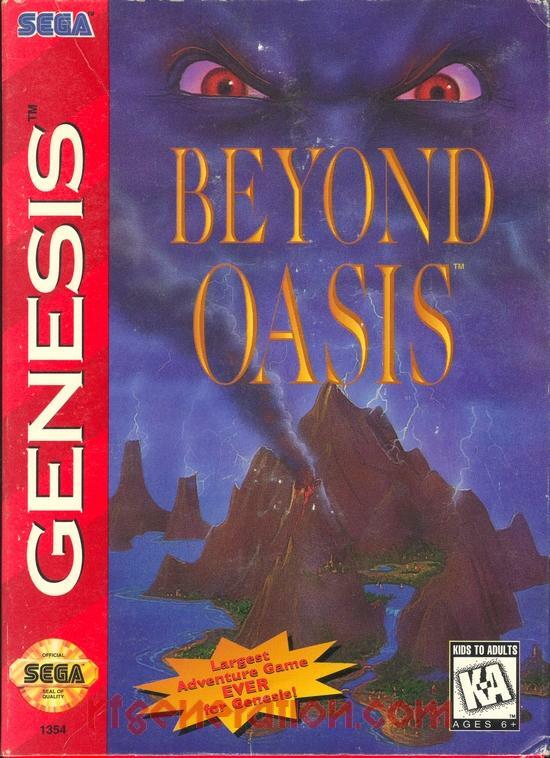 This is a game that occupies a nice niche on the Genesis, it is almost completely unique on the system. The animation is quite smooth in the game, and during battle you are graced with nothing but the sound effects of gunfire and explosions. The music is nice when it shows up, and is some of the higher quality audio for the system. With a multitap you can have up to 4 people playing at the same time, so this game is definitely made for couch multiplayer. The multiplayer is what I remember enjoying the most as a kid, and its just as fun now as it was back then. A sequel was posted on Kickstarter, but this was a complete failure. General Chaos II: Sons of Chaos was asking for $125,000 to create a high definition, hand drawn sequel of this game. It only managed to get just shy of $16,000 in the month it had. This is the greatest game I’ve ever played! 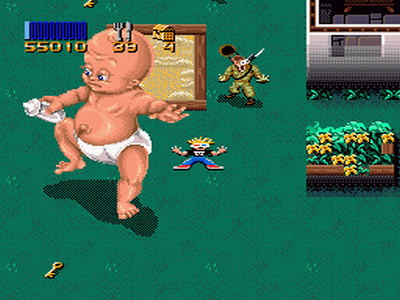 Crystal is on an epic quest of redemption, the introductory cutscene showing that all of her family and friends are lead off into the pastures of death and mowed down by automatic assault rifle firing. Enraged, Crystal dons a headband and grabs the closest AK-47 she can find, karate chopping a poor Vietcong soldier in two! She goes on the most epic shooting spree ever seen by human eyes, firing what appears to be hundreds of rounds into these pour souls without ever needing to replace her clip. Finally she confronts the evil mystic who communed with the gods and ordered her people exterminated. After giving some made up excuse Crystal pulls out her trusted Desert Eagle and blows the bearded man’s brains out. Ok, it wasn’t actually that awesome. And I know exactly what you’re thinking, Crystal’s Pony Tale? That has to be one of the girliest games known to mankind. Trust me, it is, and they did not spend much time hiding it. So let us dive right in and start off by taking a look at the cover. Well, now you know exactly how girly of a game this is, and as a muscular macho man I had to wash out the taste left behind by this game by playing some Altered Beast. First of all let’s take a look at the ponies themselves, in the immediate foreground you’ll notice a pink horse (Pilar) looking right at you with an open mouth smile. Right next to her is her brown coated, blonde maned friend Carla, also looking at the player. The pair are trotting along a narrow stone path leading to a bright, happy, suspended purplish castle. I’ve never understood children’s movies and those castles with those narrow stone paths, you wasted more stone building the castle up that high than just building one along a cliff face! Anyway to complete the cover we have a rainbow and pink clouds set to a normal blue sky behind the castle. Girls like pink right? You will play as Crystal the Mystical, Wondrous Princess and Prettiest Pony in all of Ponyland. The evil, ugly, vile Storm Witch, has just cast a spell that has frozen all the other pretty ponies of Ponyland! Gasp! Oh noes! Conveniently Crystal dodges the lightning bolt and sets out on a quest to find the magical crystals (shocker I know) that will free all the other ponies from their magical prisons. 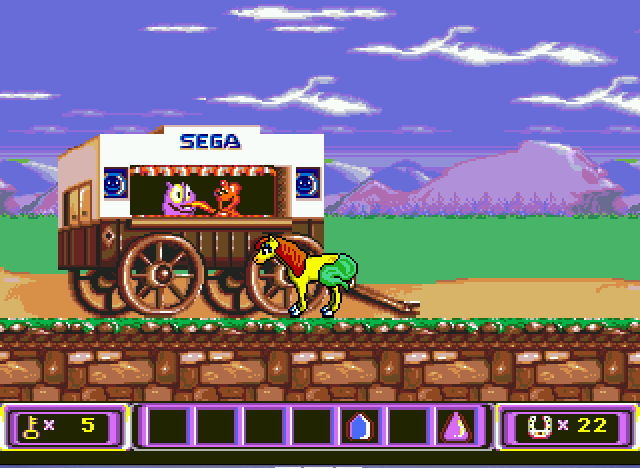 After starting the game up and navigating past the title screen you’ll come to an option screen where you have the options of changing the difficulty, changing the control scheme, and changing the colors of the pony’s body, mane, and tail that you’ll be playing. That’s… actually really cool for this time period in gaming history. Few games up till then had included a difficulty setting. And customizing the look of the character you’ll be playing as? Well it might as well have been unheard of then. After finishing up with the options you’ll continue to another screen of your pony just standing there, this is the level select screen, letting you pick which level you’ll start at between three of them; the Farm, the Dark Forest, and the Storm Witch’s Cave. Again, this is a pretty awesome option to have at this point in gaming history. Once you start playing either of these levels though you’ll notice that the bad decisions start showing their ugly heads. The controls are a bit sluggish, even with a wired controller there is some lag between the button presses and the actions that Crystal performs. She also turns and runs away from things that scare her, which is pretty much everything that’s not a cute animal, even water; ala Lester the Unlikely for you AVGN fans. What this means is that you’ll be running along, then press the jump button to vault over the obstacle and it will register too late so she’ll back away from it. Really annoying I know. You’re also pretty much invincible as there is a flaw in the difficulty setting selection, all it does is toggle how much in game help you’ll get from the NPCs you run into. So you can turn it onto hard and rear up at everything by hitting the action button until you find out what you’re supposed to do. What makes you invincible is the fact that you collect horse shoes much like you would rings from Sonic, but when you run into an enemy you only lose one or two shoes each time. After playing for ten minutes I had almost 40 horseshoes, and going between the level portals eats ten of them, so this game can practically beat itself if anybody wants to take the time to do so. All in all, its not the worst game. It is stupidly bright and so colorful that it will hurt your eyes looking at it for too long. Crystal’s Pony Tale, aside from being an obvious pun, implements some good ideas that stuck in the industry long after its 1994 release date. If you are a man, only get this game if you’re a completionist collector. If you have a little sister that for some reason has a hand-me-down Sega Genesis, then she might love this game. But to let you know how hilariously girly this game is, I popped it in and my girlfriend broke into insane laughter.